Our means of communication are inadequate yet indispensable. Communicating with others is often a struggle with transmission failure, false assumptions or loaded subtexts. There are numerous rules in conversation that are difﬁcult to decipher and can be combined in an almost limitless way. In inter-personal communication, misunderstanding therefore seems to be the rule; we constantly talk at cross purposes. But in the end, we cannot not communicate. There is only one possibility – to join in. 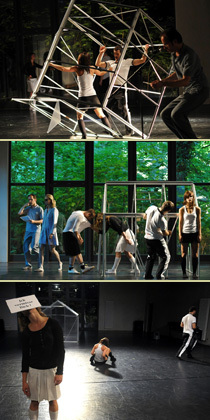 Two actors hold a dialogue that is in turn is dissected into parts by four dancers. In doing so, they bring to light what the actors want to conceal as they talk. With their typically macabre humour, the members of MS Schrittmacher take the dialogue to the limit, thereby running into the absurd that seems to be inherent in everyday situations. Premiere 9. Juni 2011 at EDEN***** Berlin.